The telecom industry in India has grown remarkably in the recent years. But have the Internet, which is considered as the most efficient and faster means of communication, able to keep pace with the growth? Even though India has been making speedy tramps in Internet marketing but, it is still far behind many nations in the World in terms of broadband. When we talk about Internet connectivity, it is still not good enough. India talks about the Digital dream, but the average broadband speed in the entire country is lesser than the half of average global Internet speed. As per a report by State of the Internet, which has been released by cloud computing services and content delivery network Akamai; the average broadband speed in the country is 2 Mbps, while the global average is 4.6 Mbps. Although, the speed is much faster than dial-up, still as compared to the rest of the world, it is much slower. India is a vast country with a population of over 1 billion and today, with the growing popularity of Internet; the number of users in the country has increased. However, they have to bear with the slothful speed of the Internet. There are 12.5 million people uses broadband out of 100 million Internet users as compared to 450 million users in China. Unless, India implements high-speed optic fiber network, making Digital India is like a distant dream. However, Government has taken a number of steps to expand the user base in the country. The Broadband Policy of India has set forceful targets for broadband connections. But, is the government successful in achieving its set target? It is important to understand that the broadband network is a combination of several technologies at various levels. The country lacks in broadband infrastructure as well as accessibility, which has created a hurdle. The government has laid a plan to construct a national optical fiber network, which will be able to connect the entire nation. According to the minister of communications and IT, Ravi Shankar Prasad, said, “The entire country will be covered by broadband within three years, and the Internet will reach the remotest villages.” This program will be able to drive internet usage in the country and improve the economy. The government plans to employ at least 10 CIOs to supervise the Digital India program, and produce four other senior positions for manage adoption of standards and security aspects. With better infrastructure, the country can attain its goal of making the country digital. Recently, inaugurated Bharat Sanchar Nigam Ltd (BSNL's) next generation network (NGN) technology for fixed-line telephones, which is sure to enhance the proposed National Broadband Infrastructure. There is no doubt that the IT sector of India has witnessed a great boom and has remarkably contributed to the economic growth of the country. The implementation of broadband network leads to a multifactor efficiency gain, which sequentially contributes to the growth of GDP. Be it residential uses or corporate use, improving the broadband infrastructure will help in economic development of the country. Studies have shown that it is a contributor to economic growth at numerous levels. First is that the enhancement and development of it will improve the productivity of business organizations by aiding the implementation of a more efficient business process. Secondly, extensive use of broadband will hasten innovation by establishing new consumer applications, as well as services. Thirdly, it will lead to a more efficient functional use of enterprises by expanding their reach to the skilled workforce, access to raw materials, as well as consumers. Hence, it is essential for a developing country like India to improve the broadband infrastructure for economic growth. With improvement in its infrastructure, broadband in India can grow rapidly. Today, as compared to other nations in the World, broadband in India is still very expensive. BSNL, Tata, Reliance, Airtel are the giants in this field and dominates the entire sector. Today, to widen the reach of its service, they have introduced and implemented technologies such as 4G, 3G, Wi-Fi, and WiMAX. It is also essential for the government to mull over the release of the necessary bands to roll out these services. 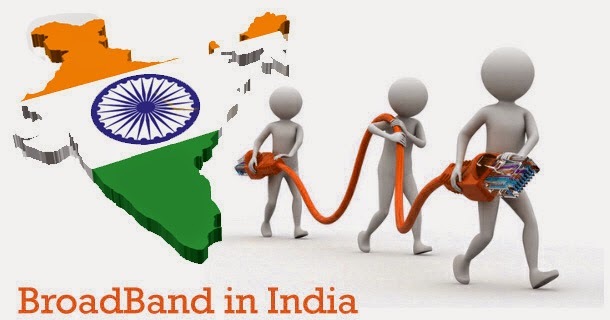 In 2010, Telecom Regulatory Authority of India had proposed the National Broadband Plan (NBP), which aimed to bring high-speed broadband connectivity to 160 million homes in the country. By 2015 end, BBNL is expected to deliver high-speed and reliable internet connection across the country and by 2020; it is expected to have 600 million subscribers with a minimum speed of 2Mbps and a maximum speed of 100Mbps. The initiative has been taken by the Government to improve the broadband infrastructure in the country and make high-speed Internet connectivity available to maximum household at a reasonable price.